The Albuquerque Isotopes are a Minor League Baseball team based right here in Albuquerque. The team, which plays in the Pacific Coast League, is the Triple-A affiliate of the Los Angeles Dodgers. Albuquerque was previously represented in the PCL as a Dodgers' affiliate by the Albuquerque Dukes, who won several PCL championships in the 1970s and 1980s before relocating to Portland, OR, as the Portland Beavers in 2001. 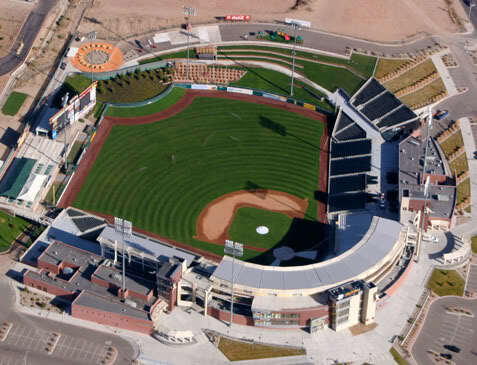 The Isotopes began play in 2003 when the Calgary Cannons relocated to New Mesico. In 2012, Forbes ranked the Isotopes as the fourth most valuable franchise in Minor League Baseball. The Isotopes' mascot is Orbit, a yellow, orange, and red alien.